I absolutely love guacamole! This is the best and easiest guacamole recipe. Slice avocados in half length-wise. With a spoon, scoop out each half of the avocado, remove the pit. Slice and dice the avocado halves and place in medium bowl. 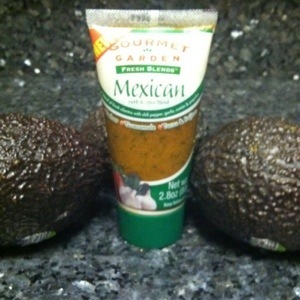 Squeeze 1 1/2 tsp of Gourmet Garden Fresh Blends Mexican Herb & Spice Blend into bowl with avocados. Thoroughly mash mixture before serving. *You can find the Gourmet Garden Fresh Blends Mexican Herb & Spice Blend in the refrigerated produce section of your grocery store. Serve as an appetizer with tortilla chips or garnish.